Anne Hathaway's Breakup: "Not A Part Of My Life Anymore"
"I was a 21-year-old kid when I met him. It wasn't a huge, dramatic breakup. We were in the process of winding it down when he was arrested. I don't talk about this, except when I'm asked. It's not a part of my life anymore. It's a complicated situation that has the ability to define me in ways I am not comfortable with." "I'm proud of myself when I'm deep in a squat, pulling from my core." "I realized that the past five years of my life had been spent accumulating things I like but never asked if I love." "I'm looking for a pared-down truth." 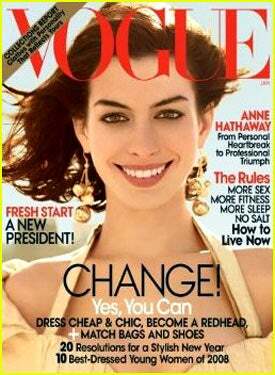 Oh, and be sure and watch the video, in which someone asks her if she is okay or something and Hathaway says, "It doesn't matter whether or not I'm dying, I'm on the cover of Vogue." Lastly, when Hathaway tries on a Diane von Furstenberg dress, she muses: "I can go on a date in this. Oh, my God. That's such a weird thought."